Update: As of Monday morning, the air quality in Santa Cruz is continuing to improve, with an Air Quality Index of 102, which is is "Unhealthy for Sensitive Groups" and means that people with heart or lung disease, older adults, and children should reduce prolonged or heavy exertion. The campus continues to monitor air quality and will update the UC Santa Cruz community as substantive developments occur. Update: As of Sunday morning, the air quality in Santa Cruz has improved, with an Air Quality Index of 130, which is "Unhealthy for Sensitive Groups" and means that people with heart or lung disease, older adults, and children should reduce prolonged or heavy exertion. The campus continues to monitor air quality and will update the UC Santa Cruz community as substantive developments occur. 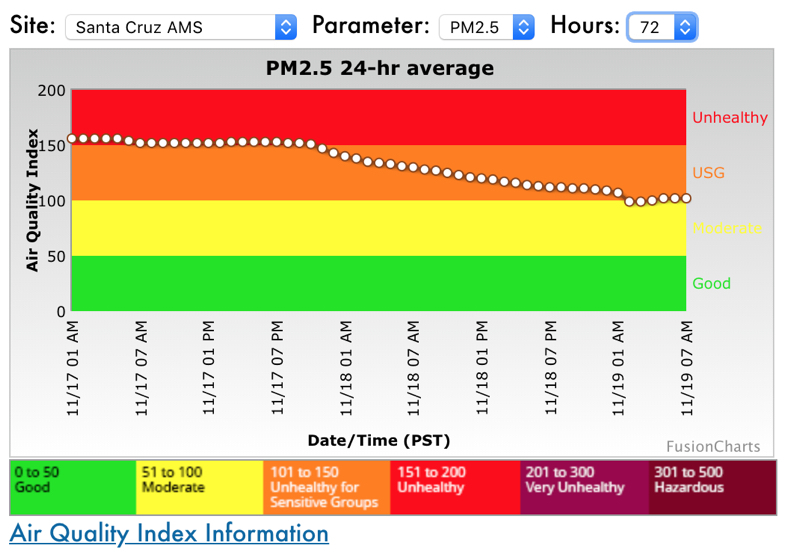 Santa Cruz continues to experience poor air quality as a result of smoke from the Camp Fire in Butte County. The EPA Air Quality Index (AQI) indicates that Santa Cruz is currently in the “Unhealthy” range, with a corresponding health message stating “People with heart or lung disease, older adults, and children should reduce prolonged or heavy exertion. Everyone else should reduce prolonged or heavy exertion.” As of Saturday afternoon, the chart on the right shows air quality levels over the past 72 hours. Campus residents with respiratory illness or other medical conditions that may be exacerbated by smoke exposure may pick up N95 masks from the three dining halls open over the weekend: Cowell, Colleges 9/10, and Rachel Carson. Although the student health center is not open on the weekend, students who may be experiencing respiratory distress should consult with other medical care providers. If you are experiencing significant imminent health issues, please dial 911. Detailed information on weekend and after-hours health care for students can be found on the Student Health Center website. Environmental Health and Safety will continue to monitor local air quality and update the UC Santa Cruz community as substantive developments occur. Remember to help protect air quality inside our buildings by keeping windows and doors closed. Employees who work outside on the weekend can contact EH&S at ehs@ucsc.edu for questions or assistance with respiratory protection.